As people live longer, stay healthier, and enjoy more disposableincome, their use of hospitality services is increasingdramatically. Hospitality Design for the Graying Generation helpsyou cater to this expanding market by providing criticalinformation on designing facilities which are sensitive to theneeds of the over-65 population. With the important principlesexplained in this book, designing for the senior consumer can becreative, cost-effective, and benefit all consumers withoutsacrificing style. When the interior design needs of the over-65 market are met, allpotential users gain, regardless of age or ability. This accessiblebook is an invaluable resource for designers, operators, and otherprofessionals throughout the hospitality industry. With millions of baby boomers rapidly approaching retirement age,the over-65 age group is the fastest-growing segment of thepopulation. As they become healthier, live longer, and have moredisposable income, their use of hospitality services, such ashotels and restaurants, will increase dramatically. 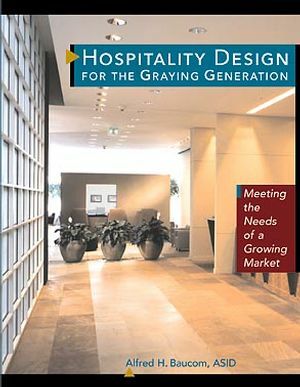 Whether you area designer or a hospitality professional, Hospitality Design forthe Graying Generation helps you plan for this growing market byproviding you with critical information for designing facilitiesthat accommodate the needs of all generations. Clearly written and generously illustrated, Hospitality Design forthe Graying Generation shows you how to address the specificphysical and psychological needs of seniors, with detailed chapterson mobility, hearing, vision, color preferences, and otherimportant areas. Going beyond ADA guidelines, Alfred Baucom'sUniversal Design approach enables you to integrate senior-friendlydesign principles into a wide range of specific environments --fromlobbies, common areas, and public restrooms to restaurants,lounges, and hotel guest rooms. In meeting the needs of the over-65 market, Hospitality Design forthe Graying Generation ensures that all potential users, regardlessof age or ability, will be well accommodated. ALFRED H. BAUCOM, ASID, teaches residential and commercial interior design at Central Michigan University in Mt. Pleasant, Michigan. He has practiced interior design for over 18 years, with extensive experience in hospitality, restaurant, and retail environments. Mobility: Dexterity, Strength, and Tactile Senses.